Certainly the most ‘visible’ high-impact branding project that we have undertaken. WDAD conducted some extensive research using in-depth telephone surveys which concluded, amongst other things, that the individual brands are not necessarily associated with the name ‘Whitbread’, making it difficult to paint an accurate picture of the company and the broad career opportunities available across the group when running corporate advertising. We needed to create a simple, visible identity for manager level recruitment that succinctly captured what the group as a whole represented, and more importantly, what it offered. The essence of Whitbread’s brands is that they support the most basic of human needs – to eat (the restaurant brands) to sleep (Premier Inn) and to drink (Costa). And Whitbread was looking for managers who can work across all their brands and engender a passion for the company as a whole – in essence to ‘Eat, Sleep and Drink’ Whitbread. The campaign launched at the ‘Careers in Hospitality’ exhibition – part of the Hotelympia event at the ExCel Centre in Docklands and attended by direct competitors and related industries such as travel and retail. 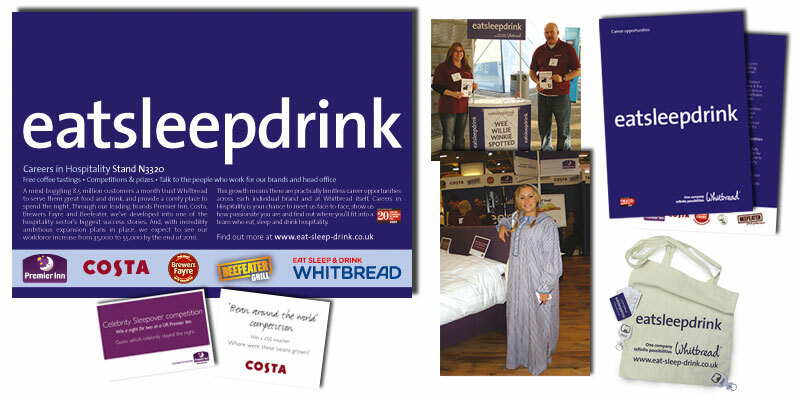 A large stand was devised in the ‘eatsleepdrink’ brand and each vertical brand given a demo area, for example Premier Inn’s new ‘Guaranteed night’s sleep’ bed was displayed and an actor employed to circulate through the exhibition dressed as ‘Wee Willy Winkie’ to encourage people to enter a prize draw. The Costa Baristas demonstrated their skills and representatives from the restaurants showcased their food. Supporting material including a corporate video was produced and pre-event we ran online and press advertising, supported by an online microsite continuing the brand personality and containing loads more information as to what Whitbread had to offer. The style and message was then used in recruitment templates for all online and press advertising and replicated on the Whitbread website. As the message gained momentum it evolved into related marketing, including internal comms material, their award-winning apprentice scheme (‘EatSleepDrink…and Learn’) and an employee referral scheme (‘EatSleepDrink…and Earn’). The final accolade for us has been that the recruitment brand has been incorporated into the Group’s corporate logo, with the strapline appearing across all signage, uniforms and marketing literature.